Bill to reinstate the electric chair as a mandatory form of execution if lethal drugs are unavailable or if lethal injection is found unconstitutional; also would make the source of drugs in executions secret. Passed House Judic. Com. 3. HB 1751 creates a new execution protocol allowing state to use either a single dose of a barbiturate or a 3-drug coctail; would provide anonymity to drug suppliers. 1. Passed House Judic. Com. by voice vote. 3. PASSED both Houses and signed by Gov. (4/15). Not clear that drugs are available. Bill to repeal death penalty for future offenses introducted the week of Mar. 16. PASSED Sen. Judic. Com. on Mar. 25. PASSED Senate 11-9 on April 2. Tabled in House Com. on May 13; still subject to vote to circumvent com. 2. HB 139 would require a unanimous jury verdict for a death sentence; SB 664 would require unanimous jury to recommend a death sentence and require a jury finding on aggravating factors. 2. Passed Sen. Crim. Just. Com.5-0. HB 71 would require explanation from the Pardons & Parole Board when it commutes a death sentence. It would also require notice to victim's family when a clemency hearing is requested Passed House. Passed Senate 55-0. SIGNED by Gov. Deal on May 1. 1. SB 1005: Bill would require secrecy for the source of lethal injection drugs and names of participants. 2. SB 1040: Bill woud require the defendant to file any claims of ineffective assistance of appellate counsel within forty-two (42) days of the Idaho Supreme Court issuing the final remittitur after completion of the unified capital appeal proceedings. 2. PASSED and became law. 1. SB 8 would expand the number of aggravating circumstances to add decapitating or attempting to decapitate the victim while the victim is still alive. 3. SB 385/HB1304 would allow death penalty for a murder committed "in or on school property" or in or on grounds adjacent to a postsecondary educational institutional; or in a building "primarily used for religious worship." 1. Referred to Senate Committee on Corrections & Criminal Law 1/6/15 and reported out of committee 1/14/15. PASSED Senate 45-4 on 1/22/15. Referred to House Committee on Courts & Criminal Code on 3/2/15 and reported out of committee on 4/2/15. PASSED House 93-1 on 4/13/15. SIGNED by Governor Pence and became law on 5/5/15. 3. SB 385 PASSED Senate, 45-5, on 2/24/15 and referred to House Committee on Courts & Criminal Code. Included in conference committee report as part of amendments to HB1304. Conference Committee Report PASSED Senate 42-7 on 4/29/15. PASSED House 75-22 on 4/29/15. SIGNED by Governor Pence and became law on 5/5/15. 3. Sen. Robin Webb has introduced a bill to reform death penalty procedures, drawing from an ABA study of the state's practice. Legislatively appointed commission recommended modifying the method of execution to include death by nitrous gas. It also recommended a bill to make the sources of lethal drugs secret. Bill to reinstate the death penalty for certain murders Hearing on Oct.14, 2015. SB 2543, HB 1305 would require secrecy regarding sources of drugs and personnel Passed Senate Corrections Com. PASSED House 82-34. HB 370 Bill to abolish the death penalty-Republican sponsor Passed Hse. Judic. Com. 11-10. DEFEATED in Hse. on a 50-50 tie vote. 2. Legislator has proposed introducing the firing squad as a backup method of execution. Inmate would be sedated first. 1. Legis. hearing held Mar. 4. PASSED Judic. Com. on Mar. 9. Goes to unicameral legislature. Debate April 16. 33 votes need to get past expected fillibuster. PASSED on first vote 30-13. More votes required. PASSED on second vote 30-13. PASSED on final vote 32-15 on May 20. On May 26, Gov. vetoed the bill. Veto override PASSED 30-19 on May 27. Implementation suspended. Referendum in Nov. 2016 to consider reinstating death penalty. One legislator has proposed reinstating the death penalty for the murder of a law enforcement officer. HB 774 "Restoring Proper Justice Act" would allow any medical professional (not just a doctor) to assist in carrying out an execution. An amendment was added to provide secrecy to those providing lethal injection drugs. Passed Hse Jud Com. PASSED House 84-33. PASSED Senate on July 27 by 33-16. SIGNED by Gov. McCrory. 1. Bi-partisan bill to implement recommendations of the Ohio Supreme Court task force on the death penalty, including improvements in the post-conviction appeal process. 2. SB 154 would abolish state's death penalty. House version also introduced (July), with bi-partisan support. 4. SB 162 would make ineligible for the death penalty individuals who have serious mental illness that significantly impairs their capacity to exercise rational judgment, conform their conduct to the requirements of law, and/or appreciate the nature, consequences, or wrongfulness of their conduct. May be considered in July. 2. Bill to allow firing squad if lethal injection is found unconstitutional. 3. Joint Sen. Resolution 31 would introduce a state constitutional amendment stating that the death penalty is in effect, that the method of execution can be changed, and that the death penalty is not cruel and unusual. 1. Passed Senate Judic. Com. 9-0. Passed House Com. PASSED House 85-10. A similar version of the bill PASSED Sen. Judic. Com. 8-0 and being sent to full Sen. PASSED Senate 41-0 on Apr.9. SIGNED BY GOV. 3. Being considered by House. PASSED legislature. Will be on the ballot in 2016. 1. Bill to make the source of drugs used in executions secret. S.553. DEFEATED in Sen. Corrections and Penology Committee by tie vote (Mar. 25). Could be resurrected. 4. HB 1159: Institute a card allowing people to express opposition to the death penalty for the person charged in the event they are murdered 1. DEFEATED in Senate Affairs Com 7-2. 2. DEFEATED in Senate Affairs Com 7-2. 3. DEFEATED in House Com. 10-2. 4. DEFEATED in House Com. 10-2. 4. SB 1071 would require prosecutors to give the defense advance notice of the setting of an execution date. 5. Bill would forbid use of informant testimony in death penalty cases if the witness stood to personally gain from the testimony. 3. Passed initial committee vote. Passed Sen. on preliminary vote 23-8. PASSED House. Additional vote needed. PASSED legislature and signed by gov. 3. Repeal of the death penalty is being discussed in the legislature, although no bill has been offered. 1. Passed House Justice Com. 5-4. PASSED House 39-34. PASSED Sen. Judic. Com 4-1. SIGNED by gov. on Mar. 23. 2. SB 1296: restrict death penalty to only those cases with conclusive proof of guilt, such as with DNA evidence or a video 1. Passed Courts of Justice Com. PASSED Senate 23-14, with amendment. DEFEATED in House, 56-42. 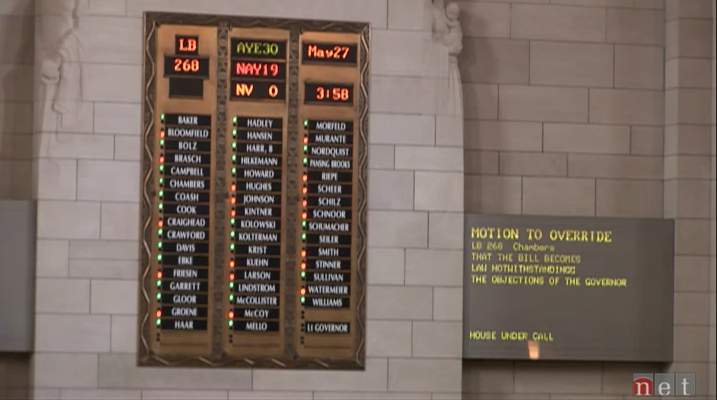 HB 1739: Bi-partisan bill to abolish the death penalty DEFEATED in Hse. Judic. Com. 2. HB 97 would abolish the death penalty 1. PASSED Senate on Jan. 16. Passed House Judic. Com. 5-4. 2. Defeated in Committee 5-4. 1. U.S. Rep. David Jolly (FL) will file legislation on Feb. 10 to make the murder of any police officer, firefighter, or first responder an aggravating factor in federal death penalty cases. Called the "Thin Blue Line Act," the bill would cover any law enforcement officer killed in federal jurisdiction, such as working on federal land or as part of a task force. 2. On June 25, Congressmen Sensenbrenner (R-WI) and Scott (D-VA) introduced a comprehensive bill to reform the federal criminal justice system. It includes addressing over-federalization; criminal discovery reform; reauthorization of the Innocence Protection Act; and notification to defendants and providing remedies for forensic science and other forms of government misconduct and/or error. (Safe, Accountable, Fair, and Effective (SAFE) Justice Act of 2015).